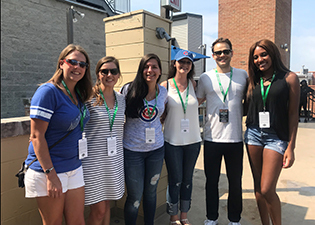 SIU CoB Alumni at a Chicago Cubs baseball game outing for Wintrust Financial Corporation. Pictured are Darla Krause, Alexis Renner, Vilda Konopouli, Melissa Kouba, Ryan Sabo and Taylor Pippen. Numerous SIU College of Business graduates have joined the Wintrust Financial Corporation team, now enjoying careers with a company recognized well within the world of business. Wintrust is a family of community banks primarily located in the Chicago-land area but with branches in other parts of northern Illinois and southern Wisconsin as well. They service 65 different bank brands at over 150 locations. With nearly 4,000 employees, Wintrust currently employs over 10 SIU CoB graduates. Some have shared "where they are now" snapshots with the college. A couple of months after graduation, Konopulli took a position as a credit analyst in Wintrust's credit rotational program. She is responsible for analyzing the credit worthiness of businesses and determining their ability to repay loans and lines of credit. Konopulli believes Wintrust's credit program is "the best in the area," and said she "feels a part of something so much bigger instead of feeling like a number at a very large bank." "Having a work/life balance is important to me. At Wintrust, I can have that because it is a relationship bank and their customer relationships are not the only relationships they value," Konopulli said. The CoB faculty, especially Tim Marlo, clinical assistant professor, and Wanli Zhao, former associate professor, helped prepared Konopulli for her current position where she applies techniques learned in class. Her fondest memory at the CoB was her project on Amazon for Assistant Professor Claire Liang's class. Kouba began working for Wintrust immediately after graduation and she is currently a rotational credit analyst in the Commercial Banking group. She said Wintrust gives her a skill-set that is "unattainable elsewhere" which sets her apart in the business industry. In addition, the network benefits she gains from being a part of the rotational program allows her to meet a significant amount of people. "Being a part of four different teams/banks provides one with a large network, which is one of the most important things in the business world," Kouba said. The CoB prepares students for such success by teaching network and leadership skills, Kouba said. "Without the CoB, I would not have the job that I have today, as it was through the weekly emails that I found the job opportunity at Wintrust," Kouba said. Krause's Wintrust career began in 2012 and she currently is a talent acquisition manager. She is responsible for recruiting and acquiring talented employees for Wintrust, as well as overseeing the rotational training program and internship program. Krause enjoys Wintrust because it is "a big company, but not a big bank" and has an "entrepreneurial feel." Originally from the small town of St. Rose, IL, Krause said she "would have never dreamed of moving to Chicago and working for a large corporation, but the CoB opened my eyes to career opportunities in other cities. I was introduced to students that are from diverse backgrounds with different ideas." "Thanks to alumni coming to recruit at SIU, I was able to make connections with a Chicago company," Krause said. Immediately after graduation, Krizman began working for Wintrust, where he is currently a lending officer for asset based lending. In this position, Krizman is a part of the AGL group, which oversees a $1.5 billion portfolio of loan commitments spread across several companies. These companies share similar characteristics such as generating low margins, having high collateral, and being commodity related. Krizman's responsibilities include monitoring the companies' performances, underwriting financial requests from the companies within the portfolio and considering new opportunities from prospective companies. Krizman enjoys the way upper management "leads by example. I work at the LaSalle Street bank location and even when I try to get in early, the president and executive are always the first people in the office," Krizman said. He advises CoB finance students to take high-level undergraduate finance courses, such as 462 – Working Capital Management and 463 – Forecast and Capital Budgeting, which he said have prepared him for Wintrust career success. Six months after graduation, Pippen began working for Wintrust, where she is currently a commercial underwriter. In this position, she underwrites new business financing opportunities for middle-market companies. At Wintrust, she especially enjoyed her time with the rotational program prior to her current position. "The program allowed me to see different management styles, work in different locations around Chicago and learn the different areas in banking," Pippen said. Pippen also considers her peers and many young professionals that she has the opportunity to work alongside as "perks of Wintrust." Pippen credits her hire at Wintrust to SIU's CoB Business Placement Center as the center helped prepare her for her interview and provided resume and cover letter feedback. Renner began working for Wintrust in July, shortly after graduating, and is currently a rotational credit analyst, where she works within Treasury Management Sales Swap Derivatives and International Payments. Renner's favorite part of Wintrust is that she belongs to a cohort. "The Credit Academy Program is what I was looking for post-graduation and Wintrust was the perfect fit for me to get into banking," Renner said. "I am surrounded by great leadership." "Use the Business Placement Center and the opportunities offered on-campus to go to career fairs, mock interviews, get professional headshots, and visit the Career Closet for interview clothing," Renner said. "The Business Placement Center is how I found out about Wintrust," said Renner. In July 2017, Sabo's Wintrust career began in July 2017 as a rotational credit analyst. He is responsible for collection, consolidation and delivering reports in order for the bank to make educated decisions regarding which companies they will grant loans to. After graduation Sabo wasn't exactly sure which line of business he wanted to work in, which is what attracted him to the rotational program at Wintrust. "The rotational program has allowed me to develop a broad business foundation, while finding where my true business passion lies," Sabo said. He believes that the CoB surrounded him with great faculty and staff who truly care about their students and their success. His favorite SIU memory is his first class he took with Royce Burnett, professor emeritus, because of the passion and excitement Burnett brought into the classroom. The SIU CoB appreciates the continued support of Wintrust as they promote the success of our Salukis.